With its high production values and an almost entirely staged story, not only is this film a rare gem in Plucińska’s own output, but also among other releases from the Documentary Film Studio in the 1950s. Plucińska scripted the story for one of the Polish fashion houses ‘Ewa’ (Eve). This is why, from its opening credits that appear against a background of red velvet, the film emanates a dream-like aura of luxury and elegance. The opening sequence presents images of a baby girl wearing a pink bow on her head. These shots are followed by a toddler and then by a little girl who is trying to put flowers in her hair. Kazimierz Rudzki, an actor of star status, introduces us to Eve and her interests in fashion. His witty comments point to women’s fixation on the looks. Listening to him, from frame to frame, we see the girl growing. From today’s perspective several of Rudzki’s jokes could be considered sexist. As he directly addresses the audience, he is trying to banter with men, here and there throwing a sarcastic comment on the shallow nature of women who can go crazy for the latest fashion news. 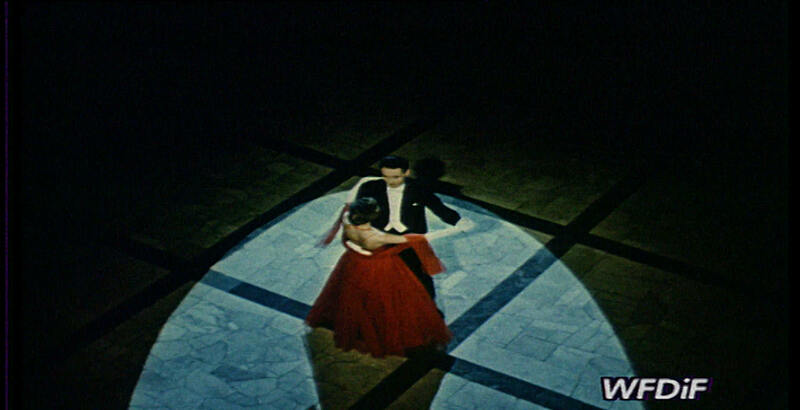 However, just like some of the unrealistically opulent sets, the dressed up characters in the film seem to be so far from the Polish reality of the 1950s that the commentator’s voice appears to be as much a fantasy as the images vibrating with bright colours. When later the film projects the dreams of a young student, who is driven by her desire to dress like a model, it starts to resemble a classical Hollywood narrative. After the first edit, we meet grown up Eve, now a student sitting behind her desk. Her outfit with red stockings and her perfectly styled hair could match some of those of the models fro m the French fashion magazine on her table. Bored with her studies, Eve decides to go on an evening walk. After a cut, we see her standing in front of a shop window looking through the glass at a fashion show. A quick fade allows us to enter the world of her fantasy. She sees herself wearing different evening dresses and attending parties. In the following sequences, we observe her dancing to classical tunes. Later, she taps to jazz music alongside a black male dancer. Serving as a presentation for different designer outfits, these scenes play to the off-screen accompaniment of further comments by Rudzki until the dream fades and Eve walks away from the camera to blend with the city surroundings. When she disappears in the depth of the frame, Rudzki closes the film with his final line: ‘We’ll meet her again. I wonder what dress she’ll have on’. It would take a lot of effort to class this staged film as a documentary because Plucińska departs too far from standard aesthetics of factual films. Nevertheless, her work offers an early glimpse into the world of fashion under Communism, which a number of female documentarians will return to in the 1960s. Although with less glamour, they will also contest the minimalist practicality of everyday life to show that some women were keen to invest in their looks to celebrate their femininity. Apart from this, with Eve looking through the glass at the elegantly dressed models, Plucińska brings a rare documentation of pockets of consumer culture emerging in Poland in the late 1950s. It was only available to a chosen few though. Most women, just like Eve, could only afford to window-shop.